In 2011 Eastern Sea Fisheries Joint Committee became Eastern IFCA. Legislation which established Eastern IFCA also increased the size of Eastern IFCA’s district to include an approximately 9-mile stretch of coast on the south bank of the Humber Estuary including the sea out to six nautical miles. This area was previously under the remit of our neighbouring Committee, North Eastern Sea Fisheries Committee (NESFC). Eastern IFCA also inherited the byelaws which were made by NESFC which only applied within this inherited area. The ‘inherited area’ is shown below. The above byelaws do not have application in the inherited area. If you intend to undertake an activity related to the above which would be prohibited by an Eastern IFCA byelaw, you must obtain written consent from the Authority. To apply for an exemption, please click the following link where you will also find more information on exemptions. The Authority for the Eastern Inshore Fisheries and Conservation District in exercise of its powers under sections 155, 156 and 158 of the Marine and Coastal Access Act 2009 hereby makes the following byelaw for the District. b. ‘biosecurity management’ means actions taken to remove or reduce the threat of adverse effects arising from invasive or non-native species, diseases, parasites or any pathogenic organisms and harmful biochemical substances to the environment or fisheries sustainability. All byelaws which are in force anywhere in the District are to apply throughout the District unless there is express provision to the contrary in a particular byelaw. unless one of the conditions set out in paragraph 4 is fulfilled. Paragraph 4 is subject to any express provision to the contrary in a particular byelaw. Byelaws do not apply to a person performing an act which would otherwise constitute an offence against that byelaw if that act was carried out in accordance with a written permission issued by Eastern Inshore Fisheries and Conservation Authority permitting that act for scientific, stocking or breeding purposes or for reasons relating to biosecurity management. The byelaw with the title ‘BYELAW 2. Application and saving for scientific purposes’ made by the Eastern Sea Fisheries Joint Committee in exercise of powers under the Sea Fisheries Regulation Act 1966 (c.38) that was in force immediately before the making of this byelaw is revoked. BYELAW XXVIII. Crustacea conservation byelaw. 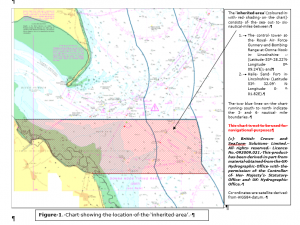 Where an Eastern Inshore Fisheries and Conservation Authority (IFCA) byelaw does not specify its area(s) of application, this byelaw causes such byelaws to have effect throughout the Eastern Inshore Fisheries and Conservation (IFC) District. Haile Sand Fort in Lincolnshire (Latitude 53° 32.09’N Longitude 0° 01.82’E). The positions above are satellite derived from WGS84 Datum. Persons exercising certain rights to remove sea fisheries resources are not subject to Eastern IFCA byelaws unless the person exercising such a right had consented to the byelaw or the byelaw has effect in a marine protected area (including: special areas of conservation, special protection areas, marine conservation zones, sites of special scientific interest, national nature reserves and Ramsar sites). This does not apply where other Eastern IFCA byelaws make express provision to the contrary. Eastern IFCA is able to grant exceptions to its byelaws for the purposes of scientific research, breeding or stocking purposes or biosecurity management (for example the removal of invasive non-native species). This byelaw also revokes several byelaws which previously applied within the Eastern IFC District.